Figure 1. Three Outside Up pattern. The Three Outside Up pattern is a three-line pattern being an extension of the two-line Bullish Engulfing pattern. The pattern was introduced by Morris, and his intention was to improve the two-line pattern performance. 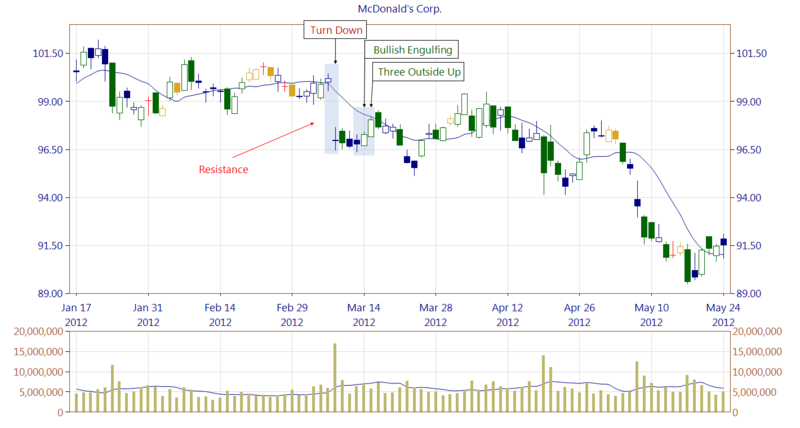 The third candle is meant to behave as a confirmation of the Bullish Engulfing. As with the Bullish Engulfing, the first black candle is engulfed by the second one with a white body. The first line can appear as a short or long line. It can be any basic candle having black body. Doji candles are allowed except the Four-Price Doji. The second line has to appear as a long line, and the candle needs to be of white color. It can be one of the following candles: White Candle, Long White Candle, White Marubozu, Opening White Marubozu and Closing White Marubozu. Spinning tops and doji candles are not allowed. The last candle line can be any basic candle, which has a white body and closes above the second candle's closing price. In the case of this pattern, shadows length do no matter. Although the idea behind the Three Outside Up is to confirm the Bullish Engulfing, in our opinion the extended pattern should be confirmed nevertheless. Confirmation can be in the form of breaking out of the nearest resistance zone or a trendline. Figure 2. 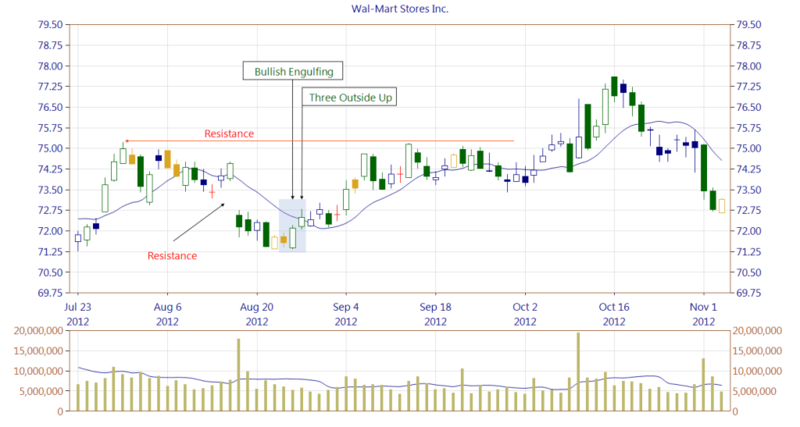 A Three Outside Up pattern is preceded by a price gap forming a resistance zone. The bulls have control by slowly pushing the price higher. To break out of the marked on the chart resistance zone takes much longer but the bulls maintained power. Figure 3. A Three Outside Up pattern is preceded by a price gap, similarly as in the previous example. However in this case the bulls were not able to cover the price gap. One might ask why, although the gap was created at a high trading volume in both situations, in one case the bulls were successful, whereas in the other not. There is no one right answer. We could give many more similar examples. We could also try to explain that in this particular case the Three Outside Up pattern price only slightly touched the trend line what indicates that the bulls are not so strong as in the first example. What we suggest is to wait for pattern confirmation every time. In any case, a proper usage of a stop loss order always is a must. 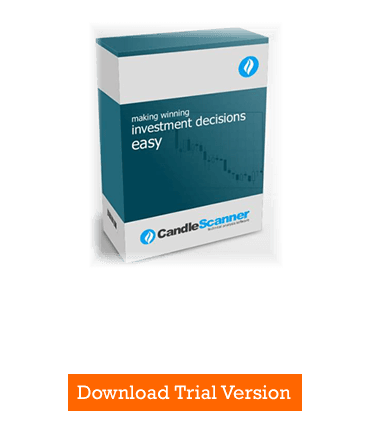 Below you can find some Three Outside Up pattern statistics calculated by CandleScanner software. To see more detailed statistics, for other markets and periodicity try our CandleScanner software. Prices start at only $10, and you can see more detailed statistics, for other markets and periodicity. Click here to find out more!